You are here: Home 2016 September How Much You Know about the Cisco Catalyst Switches? We must say Cisco is one of the most important developers of network devices in the world. The customers can choose different Cisco switches from the Nexus, ME, Meraki, Blade, and Catalyst lines. You can choose from twelve Catalyst apparatus. But you should turn your attention to the fact that not all models meet every contemporary standard. Surely, such Access switches as the Catalyst 3560, 3750, or 2960-S/SF can still be found on the retailers’ e-commerce websites, and they can still work well enough. On the other hand, modern Access switches, namely the Catalyst 3650, 3850, and 4500, have a solid heap of new features that make them stand out. Cisco provides six Catalyst models under the Core and Distribution line. Actually, the Catalyst 4500 and 3850 switches are also presented in the Access line, so you can see rather four models in the Core & Distribution line. 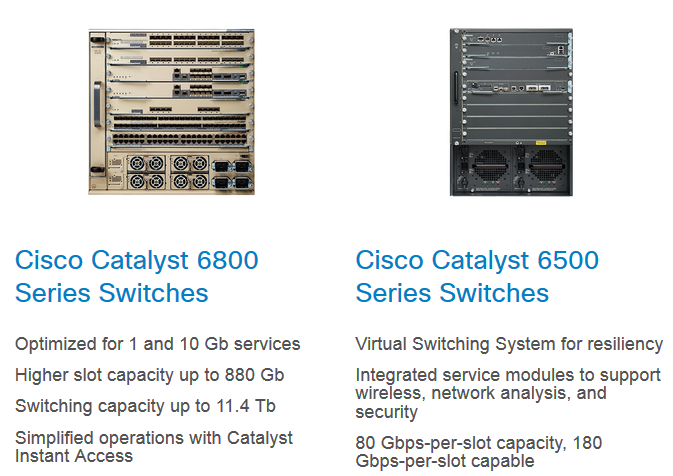 All in all, Cisco develops the next switches: the Catalyst 6800, 6500, 4900M, and 4500-X. The Catalyst 6500 also includes the Virtual Switching System. What if these two groups of switches do not furnish a suitable solution for some companies? What Cisco can offer, if, for example, you are planning to deploy a switch in an area with limited space or the cabling cannot be installed in a particular place? This is not an uncommon issue. Understandably, the Access and Core & Distribution switches may not be arranged since they are too big. In this instance you will definitely welcome the Compact line of Cisco switches. The name is environed by four models, namely the Catalyst 3560-C, 3560-CX, 2960-C, and 2960-CX switches. As usual, some devices are not truly modern: we speak about the C models. The other two switches will be a good addition to an existing network or can be used as a base for a new network. The two models: Catalyst 3560-C & 2960-C are a bit outdated. The newest Catalyst 3560-CX and 2960-CX switches have several new features that will catch the eye of potential clients. The Compact line is marketed as the best switches for use in any place, in particular, when the wiring closet is located far from the network switch. Such devices will come handy when you need to link multiple IP-phones or Wi-Fi access points to the wiring closet. Instead of connecting each device individually to the main frame via Ethernet, you can wire them up to a single Catalyst 3560-CX or 2960-CX, and then lay out a single cable to the wiring closet. This is a cost-saving solution, since you can economize on cables. Each of the latest Compact switches can be installed in an office or a classroom thanks to the completely silent operation. Cisco managed to change the inner design of the previous Compact modules to remove fans. Wow, cool! Resolved heating issues also allowed the company to increase the power delivery available via the Power-over-Ethernet ports. As usual, the Catalyst Compact switches can have either eight or twelve Gigabit Ethernet ports. However, Cisco has also made it possible to use the Multigigabit technology. More specifically, Cisco has adopted the NBASE-T know-how, which will extract more performance from the usual Category 5e, Category 6, and Category 6a cables. This feature was previously available on the top models only, but Cisco has expanded the Multigigabit feature on the Compact switches too. With regard to Multigigabit, you are not compelled to replace cabling to get 1, 2.5, 5, or 10 Gigabits per second. Nevertheless, Cisco was not able to avoid all issues, so the Category 5e cable cannot support 10Gbps. In its turn, the Cat6 cable should be no more than 55m long to ensure such speed. Surely, Multigigabit comes in bundle with the Power-over-Ethernet feature, be it PoE+ or UPoE. Another important feature of the latest CX models is that they provide the same form-factor as the predecessors. Therefore, if you have already used a Catalyst 3560-C or 2960-C, you can deploy a modern Cisco Compact switch without any strings attached. A supplementary power adapter with AC-to-DC or DC-to-DC conversion will be a good addition. The usability is enhanced even more thanks to multiple installation options. The last, the Compact switches from Cisco have a Layer 2 and 3 support with the possibility to improve to IP-services. You can choose from five featured products in the line. They are the Nexus 7000, Catalyst 6800/6500, Catalyst 4500-X, and Catalyst 3850 Fiber switches. The Nexus line will be omitted by us. As discussed above, the Catalyst 3850 and 4500-E switches belong also to the Cisco Access family, so we should concentrate on the Catalyst 6800/6500 and 4500-X. What makes the Catalyst 6800 switches so special? The entire line includes four models of different sizes made for different purposes, the top of which is the 6807-X modular switch. Basically, they all are built around the 6500 switches, which are pretty old. However, all models provide a plethora of new capabilities; including increased system capacity up to 880Gbps per a single slot (this is true for the top device). The security level was also improved. For example, Cisco offers an Easy Virtual Network that will separate corporate and personal data traffic. More than that, the company added full support for TrustSec and its techniques, namely Security Group Tagging and Security Group Access Control List. This allows system administrators to better control and handle personal access to important data. The smallest Catalyst 6800ia switch is used in conjunction with the Catalyst 6500 or 6800. (Catalyst 6800ia Switches, the Relationship with Catalyst 6500/6800) It is supported by all three bigger 6800 models. Why Cisco created such a device? You can install it in order to expand the performance capabilities of a top switch. This switch has standard features, such as 48 10/100/1000 Ethernet ports, a couple of SFP+ 10 Gigabit interfaces, and the Power-over-Ethernet. As for the last, the switch can provide up to 740W via the ports, which is a significant value. Speaking of the Catalyst 6880-X, this device represents a mid-size fixed-aggregation switch with the optimization for use in 10/40 Gigabit services. 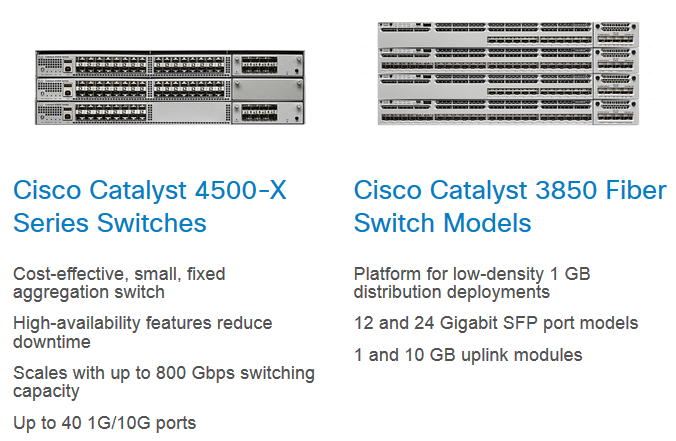 (The Cisco Catalyst 6880-X Series, What’s New in 2015?) It is incorporated in a three-slot 4.5 rack unit with a permanent supervisor engine. The device can boast of AVC support, which will help learn the data traffic from apps using the network. In other words, this helps you understand how optimize the network in the future. The Catalyst 6880-X can be used as a standalone device or in a VSS configuration. The next device is the Catalyst 6840-X – a twice smaller two-rack unit switch. This series consists of several models, which will provide you with a better choice. The models have different amount of 10 Gigabit ports: 16, 24, 32, and 40 10G. The Catalyst 6840-X is really small, so you may arrange such backbone switches in close spaces. The last suspect is the 4500-X fixed switch, which is even smaller than the 6840-X. Its single rack unit provides the VSS support, has low power consumption, and offers many meaningful networks services. These services include software for video, enhanced security and application control. For example, the Flexible NetFlow is a solution to help you monitor data traffic and plan the grow of the network capacity. Now, the Catalyst Access switches from Cisco join together twelve network devices. According to the company’s classification, four items from this group represent modern switches intended to replace the Catalyst 2960-S/SF/X, 3560-X and 3560, 3750-X and 3750 obsolete ones. Catalyst 4500 Enhanced switches are widely used campus access and distribution network devices. These switches are modular, so you can ameliorate their functionality with extension modules. The main advantage of 4500 Enhanced switches is related to the network bandwidth increase (up to 928Gbps with Supervisor Engine 8E), full support of BYOD policy, new security measures, and wired-wireless convergence. Depending on how many switches you install, the network will be able to operate with 50 up to 250 access points. Wired-wireless convergence is available thanks to the inbuilt wireless controller: now personnel may use any device with Wi-Fi connection at work. Surely, if you let them do it. The speed of wireless connection stops at 20Gbps. But we did tell that the capacity may be boosted if you install a bunch of 4500Es instead of one, didn’t we? The well-known Flexible NetFlow is also here, as well as Quality-of-Service. As usual, Cisco provided the Power-over-Ethernet+ feature with up to 30W. Support for Universal Power-over-Ethernet with 60W is also available. Let’s move to a less advanced Catalyst 3850 switch, also known as the 3750-X successor. If compared to the 4500E, this Cisco Catalyst switch offers twice less bandwidth per stack – up to 480Gbps. The stack should count four 3850 switches to reach such speed. The density was not improved from the 3750-X series: you have to enjoy the same 24-to-48 10/100/1000Mbps Ethernet ports. Nevertheless, Cisco has made aggressive improvements here and there to cheer you up. What are these improvements? This is possible thanks to the wireless LAN controller, Unified Access Data Plane ASIC, App visibility, and wireless Quality of Service. Cisco TrustSec software for wired and wireless access, MACsec encryption, and familiar Flexible NetFlow. Cisco finally carried out the necessary work to speed up the data transfers in a conventional cabling infrastructure. This became achievable after Cisco started working with the NBASE-T Alliance. The Catalyst 3850 has many models (Updated: Comparing the Newest Cisco 3850 Models), some with PoE+ and some with UPoE ports. If your network has about 100 access points, the Catalyst 3850 will easily handle them. Do you want more? Then get up to five additional SFP or SFP+ network modules that are used for uplink ports. In a standard package, you also get a redundant power supply. Although you can attach another PSU to the Catalyst 3850 to improve resiliency. If you think that all previous Access switches are not suitable or too powerful, then turn your attention to the Catalyst 3650 switches. Firstly, with Catalyst 3650 Series you can build a network with wired-wireless convergence with a single switch. Secondly, a Catalyst 3650 switch can have either 24 or 48 GE ports, just like its big brother 3850. There is no reason to use a 3850 switch, if you have only 25 access points in the network, since a simpler Catalyst 3650 will easily deal with them. The network bandwidth in a stack can reach 160Gbps, which is thrice less than in the previous switch. The device has three versions of uplinks with either four 1Gb, two 10Gb, or four 10Gb ports. Surely, it also has Layer 3 routing features. The Catalyst 3650 is no different from the 3850 switch regarding the available power supply options. Again, you get a single PSU by default, while the second one is gettable only for extra coins. The same goes for three cooling fans. The last but not the least, Cisco has presented 13 models of Catalyst 3650 switches, so you can waste a lot of time choosing a solution. The Cisco Catalyst switches is the most complete and comprehensive line of products for building networks. Spec-wise, Cisco Catalyst switches compete quite successfully on the highest level. Say, HP has made the 5400R zl2 switches to destroy Cisco’s 4500E family. And they fail to succeed, because HP does not resolve scalability issues, wired-wireless convergence for networks, uplink redundancy, etc. It is true that Cisco discontinued many Catalyst switches. Even so, you can search for older models on the Internet. Why should you buy new models? As we told many times, one of the key features in the latest Cisco Catalyst switches represents wired-wireless convergence in one apparatus. Another important characteristic is the density and the size of a switch. Look for the bandwidth: The fewer devices will use your network, the less bandwidth should your switch have. Besides, all switches are future proof and VSS-compatible, so building stack is easy with Cisco.